My daughter meets Chelsea Clinton. 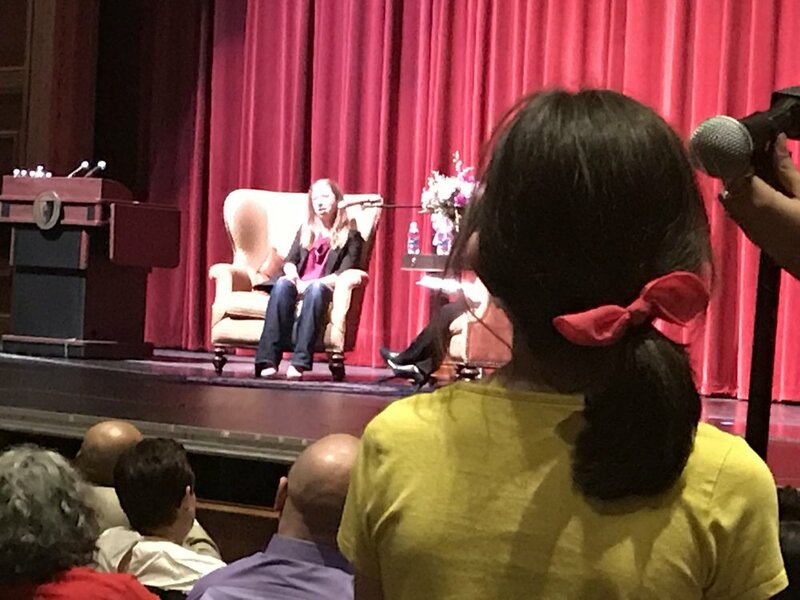 These are photographs of our little girl asking Chelsea Clinton a question about Malala at a lecture at Central Connecticut State University yesterday. “Best day ever!” she shouted. Maybe not best day ever, but possibly top 10 for Clara. Not only does she know Chelsea Clinton as a remarkable humanitarian, but her picture book, She Persisted: 13 American Women Who Changed the World, is one of her favorites. Clinton's newest book, She Persisted: 13 American Women Who Changed the World, also features Malala Yousafzai, who Clara also loves. She's read several books about Malala and has even read portions of her adult memoir, I Am Malala. A special day for our girl. Later, Clara met Clinton personally when she had her book signed. She shook Clinton's hand and exchanged a few words. Charlie, too. As an added bonus, Clinton loved the shirt that Elysha was wearing (and that I designed and gave to her for her birthday) and asked to take a photo her to show her mother. I think Elysha was almost as excited as Clara at that moment.